Ever since I started writing email newsletters, the one thing that always bothered me was email frequency. Should I send emails daily? Should I send them once a week? Or twice a week? Maybe once a month? So I turned to the internet for finding the optimal email frequency. And as usual, I found various suggestions on the internet about how frequently I should email my subscribers, like this one and this one. I also found some people recommending to religiously send emails every day. Yes, Really! The whole premise behind sending frequent emails was to keep my subscribers engaged by providing them high quality information on a particular topic. I tried all the suggestions I found. I got nothing but unsubscribers and hate emails. Wasn’t I supposed to get happy subscribers? I was delivering a lot of value in each email. There were no sales pitches or any gotchas or catches in any of the emails. Then why were people unsubscribing? Surely, I was failing to optimize my email frequency. After some deep brainstorming sessions I realized that there are no best practices when it comes to the frequency at which you should email your subscribers. 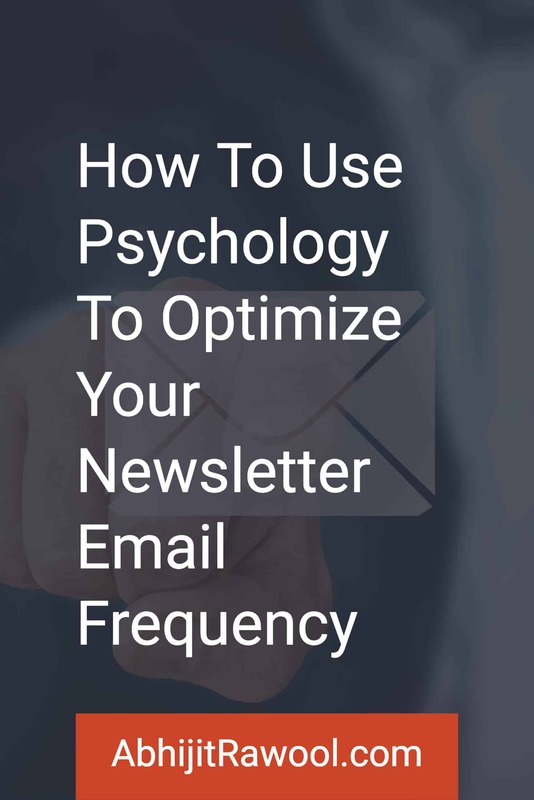 Rather than trying to optimize your email frequency using best practices, you should use basic human psychology to optimize the frequency of your emails. Imagine That I Am Your Best Friend. Now, would you mind if I email you daily? Or twice a day? Everyone of us loves to hear and talk to our best friend. It doesn’t matter how many times your best friend emails you or calls you. You are always okay to hear from your best friend. You are always there for your best friend and your best friend is always there for you. Imagine That I Am Your Friend, But Not Your Best Friend. What if I email you every day? Or twice a day? At first, you would be okay. Then you will start to get annoyed. Then you will start ignoring me. And finally someday, you are going to be really angry on me and ask me to stop emailing you. Or even stop talking to you. That is what we all do in such situations. Imagine That I Am Someone You Know. I Am Not Your Friend Or Best Friend. What if I email you daily? You won’t like it a bit, will you? Okay, what if I email you every other day? Still you will hate me, won’t you? None of us likes to get frequent emails from people who we just know. Receiving frequent emails from people who we just know is not acceptable to us. That is common to everyone of us. Imagine That We Just Met On The Internet. You came to my website. You liked what you read, so you signed up for my newsletter. Can I email you everyday now? Or every other day at least? Hmmm… You know the answer. It is still No. After all, we just met on the internet. Why would you want to hear from me every day or every other day too? It does not matter how valuable my content is, how helpful my content is, or how enthusiastic you are to get an email from me, after a few days, you will want me to stop sending you frequent emails. After all, you have got a life to live too. Correct? Sending frequent emails might sound like a good idea, and it might work for a few weeks or months, but soon your subscribers are going to get tired seeing you frequently in their inbox. And even though they like to hear from you, they will just not have the time or energy to read your emails frequently. And at some point, they will stop reading your emails. They might not unsubscribe, but they might just put all your emails in the “Will Read Later” folder. Is there a better way to optimize your email frequency? Optimize Your Email Frequency Based On Basic Human Psychology. In all the above examples, you saw how your desire to receive emails from people kept decreasing as you became less familiar with them. That is basic human psychology. That is how our minds work. You as an email marketer have to understand this. Your subscribers do not see you as their best friend. Not even a friend. And not even someone they know. You are just a random guy/gal who they met on the internet. They are not expecting to receive emails from you daily or every other day. How about emailing them once a week? Ask that question to yourself? Would you mind receiving emails every week from someone you met on the internet? Specially if the emails are loaded with really helpful content? I guess, you know the answer. And this time the answer is a Yes! Receiving emails once a week from people who we have met on the internet sure doesn’t sound that bad. And if the emails contain information that really helps you, then you are always happy to read those emails. But why only once a week? Why not once every two weeks or once every month? Why You Should Send Emails Only Once A Week? Again imagine that I am your friend and I keep in touch with you every week. Then I start keeping in touch with you every two weeks. And then finally once every few months? Our friendship is going to get affected. From your friend, I will soon start to become just a person you know. Keeping in touch once a week kept that friendship alive. Now that we hardly interact with each other, you are less likely to pay attention to what I have to say, leave alone to act on what I say. Emailing your subscribers once a week will help you to keep that friendship alive with your subscribers. I have found that emailing once a week is a good optimal email frequency. But should you always keep emailing once a week? You Can Increase Your Email Frequency. But only increase it after you have moved from that “Just Met On Internet” zone to the “Friend” zone. Once you are in the Friend zone, you can email your subscribers twice a week or sometimes even daily. But send those daily or twice a week emails only on special occasions, like during your Product Launch, Product Sale, or some other important events. You are still in that “Friend” zone, remember? So there is no need to send a lot of emails frequently. You should also realize that it is very unlikely that you will ever become the best friend of any of your subscribers. Not impossible, but difficult and unlikely. So be very happy if they start considering you their friend. And anyway, your aim should be to become their friend. After all, they are human beings and not just a number in your email marketing software. Did you get an idea of how to optimize your email frequency? Because this is something that has taken me a long time to understand and figure out. And this is something that I have started to put into practice on this website too. Sign up for my email newsletter to see all of this in action. And if you still have any questions, just ask them in the comments below.